Puntarenas (a prime area) is the largest province in Costa Rica. Its varied attractions include rainforests and cloud forests, hills, mountains and valleys, mangrove swamps and lagoons, and the country’s beautiful Central Pacific coasts. Deforestation has ruined large parts of the region, but Puntarenas tries to make up for it with wildlife reserves and national parks. Puntarenas and its beaches are easily accessible from San José, Costa Rica’s capital, making the province even more ideal as a tourist destination. Puntarenas’s coasts are sunny all year. Occasional rains in the southern coasts ensure that the forested areas are green and well nourished. The waters are great for swimming, snorkelling, surfingand sport fishing. The capital town, Puntarenas, was once one of the main sea ports in the country. It is still a stopover point for Pacific cruises, but commercial fishing is now the main industry. It has some of the best seafood restaurants in Costa Rica. While the capital is not really tourist-orientated, it is a favourite place to visit by Costa Ricans from other provinces, particularly San José. Manuel Antonio National Park in the town of Manuel Antonio has white sand beaches with a lush vegetation of primary and secondary forests and mangrove swamps. Houses peek out of trees, their colourful facades providing a charming contrast to the green landscape. The Osa Peninsula, Costa Rica’s eco-tourism centre, boasts an unrivalled biodiversity. It is not only a popular spot for leisure travel and educational tours, but is fast growing as an international residential community. Some of the beaches in Puntarenas are still undeveloped. The verdant Osa Peninsula faces the southern Pacific Ocean. It is hotter and wetter here than most of the central coast. The area is largely wild, rugged, and boasts an intense biodiversity, making it a top eco-tourism destination in the country. The largest tropical jungle in Central America is protected in the famous Corcovado National Park. The expansive park is home to pumas and jaguars, endangered eagles and scarlet macaws, and the venomous fer-de-lance snake. The peninsula was once largely mined for gold, which destroyed coastal rainforests. Corcovado National Park was formed to protect the remaining areas and its significant population of bird and mammal species. Osa’s towns have their charm. Puerto Jimenez, the peninsula’s main city, is primarily a transport point, providing access to the region’s coastal villages and the Corcovado National Park. Golfito is a tax-free shopping zone, with interesting flea markets. Carate has the lure of wildlife and waterfalls. The coastal village of Cabo Matapalo, with its long beach and great surf, is the most popular town in Osa. Its isolation makes the small village of Cabo Matapalo in Osa Peninsula a popular and idyllic travel choice. Surfers love the swells of its small beach, and eco-tourists come here to explore the stunning Corcovado National Park. The town’s infrastructure is quite basic, except for the modern services and facilities along the beach strip. The biological reserve Isla del Caño, which has abundant marine life and a large population of coral-building organisms, can be easily accessed from Matapalo. Manuel Antonio and its close neighbour, Quepos, have some of the world’s most stunning white sand beaches and hidden coves, with beautiful views of the sunset. The Manuel Antonio National Park, the smallest yet the most visited park in the country, is lush and beautiful, covered in rich primary and secondary forests. It is the home of several species of monkeys, including howler monkeys, the endangered squirrel monkeys, and the playful capuchins. Scarlet macaws, toucans, sloths, raccoons, and iguanas also thrive in the park. Manuel Antonio encompasses lagoons, mangrove swamps, and small isles just off the coast that are visited by dolphins and whales. The park also has an unusual and scenic feature extending into the North Pacific: Punta de Catedral, once an island but now joined to the park by a narrow isthmus that developed over time. Here are two of Costa Rica’s loveliest beaches: Playa Manuel Antonio and Playa Espadilla Sur. Both beaches have white coral sand and palm trees. Playa Manuel Antonio is safer for swimming, as Playa Espadilla Sur has a strong undertow. The other two beaches in Manuel Antonio National Park are Playita and Escondido. The adjoining beach towns of Quepos and Manuel Antonio are particularly desirable to foreigners. Hollywood stars have stayed in their 5-star hotels. Boutiques, restaurants and nightspots draw crowds. There is an airport for small crafts, a marina, and a public hospital. Local and foreign businesses line the highway, and many houses peep out from the forested hills. 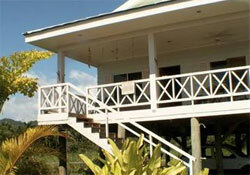 As Manuel Antonio is a very popular destination, real estate prices here are steep. There is not much available land left on the coasts, as they are already densely populated and lined with buildings. More properties are offered on the mountains and foothills, which have amazing views of the ocean. Puntarenas has come down a bit from its days as one of the most important port towns in the country, but it still enjoys the loyalty of many Costa Ricans who make it their main destination when they need a short getaway. Puntarenas’ port is still busy; it is a stopover point for cruise ships sailing to the Nicoya Peninsula and around the Pacific, and strives primarily on commercial fishing. Puntarenas has some of the best seafood restaurants in Costa Rica, though its most famous local dish is a dessert. The Churchill, as it is called, combines ice cream with crushed ice, milk and layers of syrup. Puntarenas is not exactly a bastion of environmental cleanliness, but surprisingly one of its beaches has garnered a Blue Flag, an international award given to clean and well-maintianed beaches. Puntarenas’ seven-mile brown sand beach is a popular holiday spot and boasts spectacular sunsets. The seaside promenade Paseo de los Turistas is the most vibrant part of town. It is lined with hotels, sodas (small, family-run restaurant-stores), restaurants, discos, bars, and souvenir kiosks. Puntarenas has the only marine museum in the country and the restored, 19th century Nuestra Señora del Carmen Cathedral. The town of Monteverde was founded by American Quakers. They set aside a large tract of land for conservation. It is now the beautiful Monteverde Cloud Forest Preserve and is a prime destination for eco-tourists. The reserve has an outstanding display of tall trees, orchids, vines, mosses, and ferns. It is home to about 2,500 plant species including several varieties of orchids, 400 bird species dominated by hummingbirds, 100 mammal species, and thousands of insects. There is still a Quaker population in Monteverde. The town is also known for its local artists, and has several art galleries, craft stores, and souvenir shops.